In 1905, the cornea became the first solid tissue ever to be transplanted successfully (1). Over the last century, corneal transplantation has evolved into an array of techniques focused on the selective replacement of diseased layers of the cornea, tailored specifically to the underlying pathologic condition causing the corneal dysfunction. Major advances have been made in corneal procurement, preparation and processing, greatly increasing the number and quality of suitable corneas available for transplant (2). The purpose of this tutorial is to provide a comprehensive guide to the meticulous practice of procuring corneas for transplantation, including grading the health of the tissue, determining suitability for transplantation, and preparing the cornea for its designated type of transplantation. The process of preparing corneas for transplantation begins well before the patient enters the operating room, and requires a round-the-clock commitment from eye banking staff and technicians. It is important to keep in mind that while many individuals serve in various capacities to make cornea transplant surgery successful in restoring sight to thousands annually, the process is dependent completely on the selflessness and generosity of organ and tissue donors. While systemic comorbidities such as malignancy and cardiovascular disease disqualify affected individuals from donating other organs and tissues, these conditions do not necessarily restrict individuals from donating their corneas. Common ocular conditions such as cataracts, glaucoma, and a history of LASIK surgery also do not preclude donation. Importantly, no matching process is required between the donor and the recipient. In patients undergoing penetrating keratoplasty (PK) for Fuchs endothelial corneal dystrophy or pseudophakic corneal edema, ABO blood group, Rh factor, and combined antigen incompatibility did not increase the risk of transplant failure attributable to graft rejection or differences in endothelial cell survival 5 years after surgery (3). The expression of ABO antigens is not uniform in all corneal layers. Additionally, human leukocyte antigen matching as studied in the Collaborative Corneal Transplant Study conferred no benefit regarding cornea transplant rejection (3). Serological matching is not required for successful cornea transplantation because of the extensive immune privilege that is characteristic of corneal tissue. Cornea immune privilege is governed by three immune-regulating mechanisms (1). First, there is an afferent blockade of the immune response to foreign tissue. The avascular nature of corneas prevents alloantigens from transplanted tissue from reaching host lymph nodes. The absence of antigen-presenting cells that are both MHC-II and B7 positive aids in this afferent blockade, although irritating stimuli such as cautery and sutures can activate these cells and promote an immune response and subsequent rejection. Second, corneal transplant tissue can down-regulate the Th1 lymphocyte response from the host tissue. Th1 down-regulation is mediated by immunosuppressive cytokines and peptides present in the aqueous humor, most notably FasL. This immune escape is termed anterior chamber-associated immune deviation (ACAID). Finally, there is an efferent blockade of the immune response to the donor cornea tissue. FasL, the same protein that down-regulates the Th1 response, is also involved in inhibition of the efferent blockade. A disruption in any of the three mechanisms that help create an immune-privileged environment may result in immunologic rejection of corneal tissue. Any cornea deemed suitable for transplantation can be grafted into any recipient, regardless of recipient age, race, and blood type. Eye banks, in concert with guidance from the Eye Bank Association of America (EBAA) and Food and Drug Administration (FDA), help set policies and procedures that guide suitability determinations for cornea transplantation and proper storage and handling of transplant tissue. There is a 24-hour window of opportunity from the time of a donor's death to procure a cornea and place it in storage media. Unlike organ donation, in which procurement is extremely limited by time and the immediate availability of a potential recipient, corneoscleral tissue can be stored and used up to 14 days after procurement before it expires. In Iowa, willingness to become an organ, tissue, and eye donor is coordinated through the Iowa Donor Registry (https://www.iowadonorregistry.org). Registration is a binding contract for potential donors. Donor registration at the Department of Motor Vehicles is connected to the Iowa Donor Registry, and is also a binding contract. Families of a deceased individual also impact the donation status of their loved ones. FDA requires that the next-of-kin participate in an extensive medical history questionnaire regarding the donor's health. This is an opportunity to obtain important information about the donor's life – travel history, infection history, sexual history, drug and alcohol abuse, and other information – in order to gain a better understanding of donor eligibility. If the family refuses to provide this information, donation is not pursued. 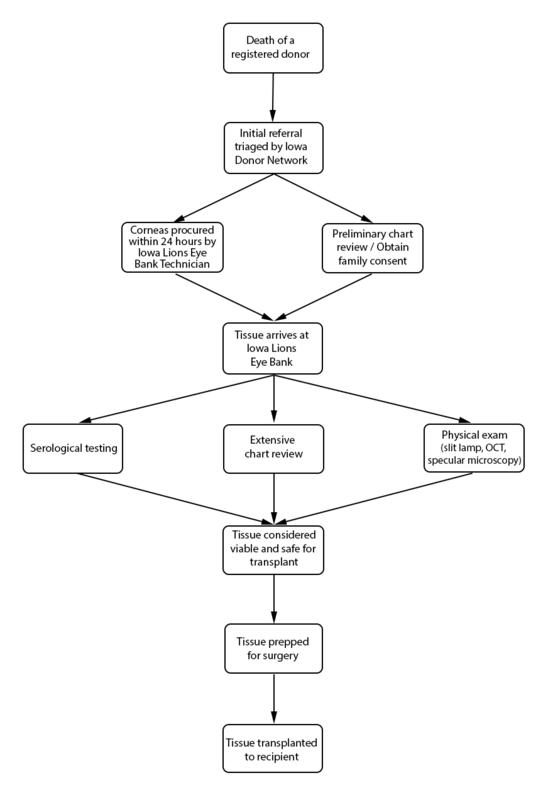 Flowchart depicting the typical progression of a cornea from the death of a donor to transplanting the cornea to a recipient. Hospitals are required to report all deaths to a donor agency, such as the Iowa Donor Network (IDN). The hospital provides basic patient information, such as name, age, race, and cause of death. Regardless of donor status, IDN is notified of a patient's death, assuming the death occurred in a hospital. Reporting a death to IDN that occurs outside of the hospital (i.e. home, hospice care, crime scene, etc.) is not required. The total number of organ, eye, and tissue donors is limited significantly by under-reporting of potential donor deaths that occur outside of the hospital setting. Upon notification of a potential donor, IDN notifies organ donor organizations, to include the Iowa Lions Eye Bank (ILEB), and the process of obtaining family consent for organ, tissue, and eye donation begins. In situations where a deceased patient is not a suitable organ and tissue donor (such as with cancer patients), he or she may still be a suitable cornea donor, and ILEB continues the consent process with the family of the deceased. Procuring donated organs, tissue, and eyes is a 24-hour-a-day commitment. Upon notification of eyes in need of procurement, a technician is sent to the procurement site – typically an operating room, hospital room, morgue, funeral home, or any other designated procurement site that meets the aseptic criteria for procuring tissue. The recovery technician identifies the donor and compares the registry information with the patient information on his or her medical chart. A post-mortem blood draw is performed for serological testing. The recovery technician also completes a full body examination, noting specifically any signs of disease, high-risk behavior, and identification marks. A penlight examination of the eyes is performed, noting findings such as epithelial exposure, scars, and arcus senilis. The procurement is performed using aseptic surgical technique. If the eyes donated are designated for transplantation, only the cornea is procured. If the eyes donated are designated for research purposes, the entire globe is procured. If requested, the sclera can also be procured and prepared for a scleral patch graft. Death-to-procurement protocols are established by individual eye banks. At ILEB, eyes donated for transplantation must be placed in storage media within 24 hours of the time of death. Corneal storage is an important element of cornea transplantation that has increased the opportunity for successful corneal procurement and surgery. Corneas are kept in cold storage medium at 4˚ C after procurement and during processing. ILEB uses Optisol-GS (Bausch & Lomb, Irvine, CA) as their storage medium, which contains dextran, ascorbic acid, vitamin B12, gentamycin and streptomycin. 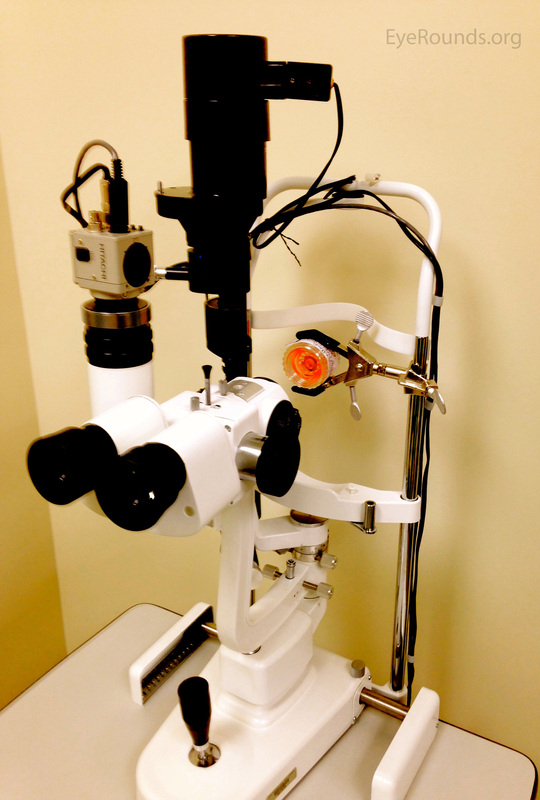 Once the cornea is placed into storage media, it must be used within 14 days. After this time, the cornea is no longer considered suitable for transplantation. Once ocular tissue arrives at ILEB, 3 distinct reviews are performed, and each tissue must clear all required reviews in order to be deemed suitable for transplantation. First, ILEB staff members conduct a review of serological testing, which is performed at a certified lab using post-mortem blood drawn at the time of tissue procurement. Special attention is given to results of infectious disease testing, including hepatitis B, hepatitis C, HIV 1 and 2, and syphilis. At ILEB, a positive screening test for any of these infectious diseases render the tissue unsuitable for transplantation or research, and a confirmatory test is not performed. An exception applies when testing for syphilis, in which the screening test has a high false positive rate, and thus a confirmatory test is utilized. Second, eye bank staff members conduct an extensive chart review of the donor's past history. While paying particularly close attention to the medical history during the last week of the donor's life, they also look back in the medical history for items such as previous infections, travel history, behavioral risks such as intravenous drug use, and evidence of neurodegenerative disorders. While certain findings can prohibit donation completely, others can result in restrictions on donation (Table 1). For example, at ILEB, donors with a history of diabetes mellitus are not prepared for Descemet membrane endothelial keratoplasty (DMEK) due to increased risk of graft preparation failure (4). In addition, there are age restrictions for cornea donation specific to ILEB. For example, for DMEK prepared corneas, the donor age must be between 50-75 years old. For all other cornea transplants, the donor age can be between 2 and 75 years old. Last, ILEB technicians perform a physical inspection of all donor tissue using slit lamp biomicroscopy and ancillary imaging techniques. During slit lamp examination, technicians look for stress lines, mechanical trauma from procurement, scarring (from prior trauma or surgery), corneal edema, and infiltrates that could indicate poor tissue quality (Figure 1). Using optical coherence tomography (OCT), technicians are able to determine the thickness of the corneal tissue (Figure 2), which is important in tissue processing for certain transplant types. For most cornea transplants to be successful, the corneal endothelium must function properly. Although there are no tests currently capable of grading tissue based on functional capacity, efforts are underway to develop such testing. Using specular microscopy, technicians are able to image and analyze corneal endothelial cells for characteristics of health. Specular microscopy is a surrogate method that describes endothelial cell morphology and may indicate cellular viability (Figure 3). Specular microscopy quantifies the size and shape of corneal endothelial cells. 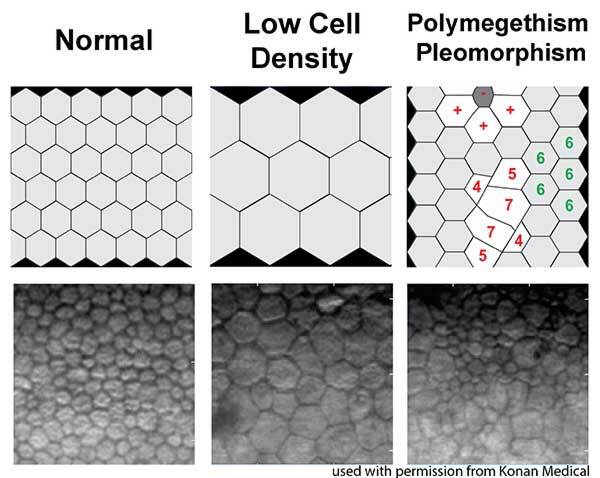 In health, the corneal endothelium has a high percentage of hexagonal cells of a characteristic size. High degrees of variation in cell size (polymegethism) or cell shape (pleomorphism), cell dropout, and guttae changes are causes for concern in the viability of donor tissue (Figure 4). Figure 1: Slit lamp examination of a donor cornea. Figure 2: OCT imaging is used to determine the thickness of the corneal tissue. Figure 3: Panel showing, from left to right, the specular microscope used at the Iowa Lions Eye Bank (Konan CellChek EB-10), an image of a healthy corneal endothelium, and a histogram showing the distribution of cell size and numbers of sides. Images adapted with permission from Konan Medical USA, Inc, Irvine, CA. 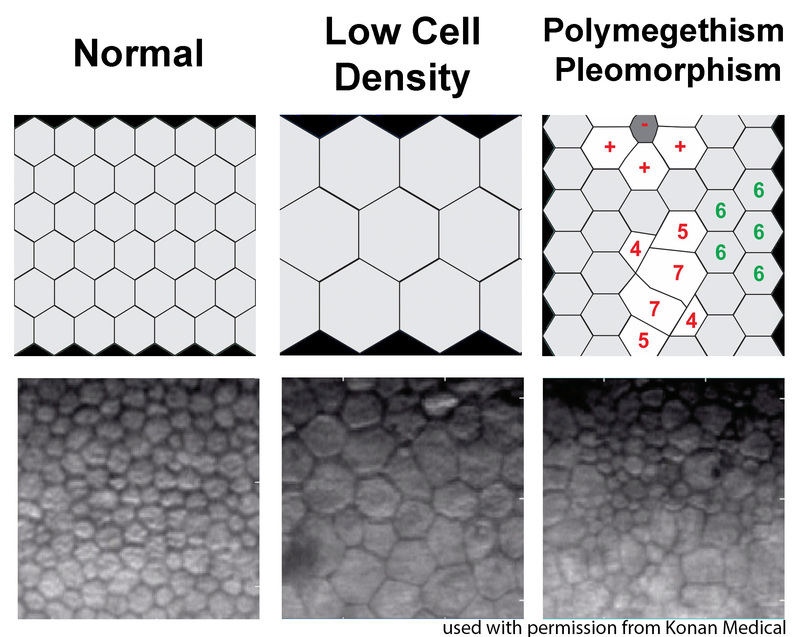 Figure 4: Panel showing, from left to right, both cartoon representations (top) and real images (bottom) of normal corneal endothelium, corneal endothelium with low cell density, and corneal endothelium with polymegethism and pleomorphism (the "+" indicates a larger cell, the "-" indicates a smaller cell, and the numbers indicate the number of sides forming the cell). Images adapted with permission from Konan Medical USA, Inc, Irvine, CA. For any transplant involving the corneal endothelium, ILEB requires a minimum endothelial cell density (ECD) of at least 2000 cells/mm2 in order to release tissue for surgery. If the ECD is less than 2000 cells/mm2, the tissue may still be used for anterior lamellar keratoplasty techniques such as deep anterior lamellar keratoplasty (DALK) or corneal patch grafting. The cornea is removed from storage media and positioned endothelium-side up on a vacuum trephine (Barron punch trephine system; Katena Products Inc, Denville, NJ). A 9.5mm trephine is used to make a partial-thickness cut through the endothelium-Descemet membrane complex (EDM) and into the posterior stroma (50-100 µm deep). The trephination edge is made more visible using trypan blue 0.06% ophthalmic solution (DORC International, the Netherlands). The peripheral EDM "skirt" tissue is peeled away and discarded. At this point, the technician begins to separate the EDM from the stroma using a non-toothed forceps. Careful attention is given not to apply too much stress on the endothelium, as it is delicate and may tear. The EDM is separated completely from the stroma for approximately 270 degrees circumferentially, leaving only a peripheral zone of 10-20% of the corneal area adherent to the stroma. The peeled portion of endothelium is replaced carefully in its native anatomical position. If requested by the surgeon, an additional, smaller punch (e.g. 7.5 mm) is made with a vacuum trephine to produce a smaller graft, and the remaining peripheral skirt is discarded. In some instances, an "S" stamp is placed on the graft. This is used as an aid for proper graft orientation in the recipient during surgery. After the EDM is separated, and while it is lifted off the stroma, a 3 mm punch is made through the entire stroma, creating a stromal plug. The endothelial tissue is laid back down in its native anatomical position and the cornea is inverted. The corneal plug is removed and Descemet membrane is exposed and dried carefully using a Weck-Cel® sponge (Beaver-Visitec International, Inc, Waltham, MA) or gauze. An "S" stamp is inked with gentian violet, allowed to dry for at least 10 seconds, and placed briefly on Descemet membrane. The plug is then replaced. Figure 5: Cornea prepared for use in Descemet membrane endothelial keratoplasty (DMEK). Note the "S" stamp, used as an aid for proper graft orientation in the host. Video 1: Preparation of tissue for Descemet membrane endothelial keratoplasty (DMEK). If video fails to load, use this link. 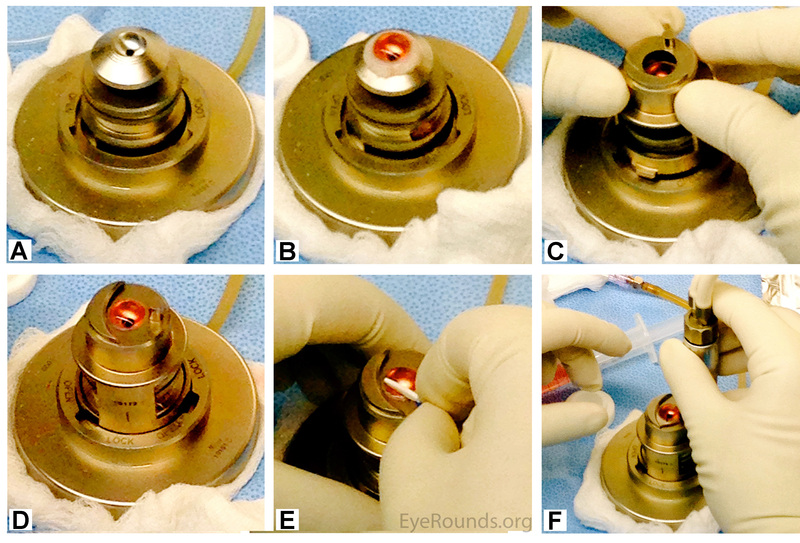 Figure 6: Panel showing the preparation of a cornea for Descemet stripping automated endothelial keratoplasty (DSAEK). A. Artificial anterior chamber. B. Donor cornea placed on the artificial anterior chamber. C. Helmet placed atop the donor cornea. D. Donor cornea sits atop artificial anterior chamber with helmet in place. 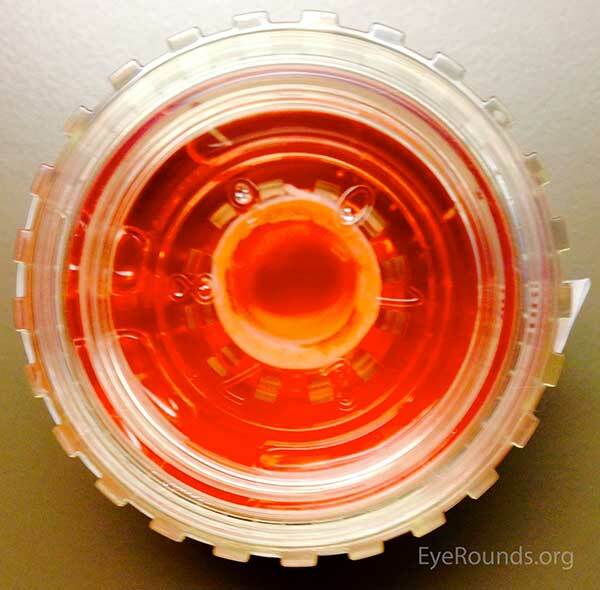 E. Donor corneal epithelium removed with a Weck-Cel® sponge. F. Microkeratome makes a partial-thickness cut through the stroma of the donor cornea. The corneal structure is maintained using an artificial anterior chamber loaded with a bubble of Optisol GS (Figure 6a). The cornea is placed on the artificial anterior chamber (Figure 6b), and the helmet is placed on top (Figure 6c). Pressure is applied underneath the cornea using a balanced salt solution (BSS) (Figure 6d). If indicated, the corneal epithelium is removed with a Weck-Cel® sponge (Figure 6e). 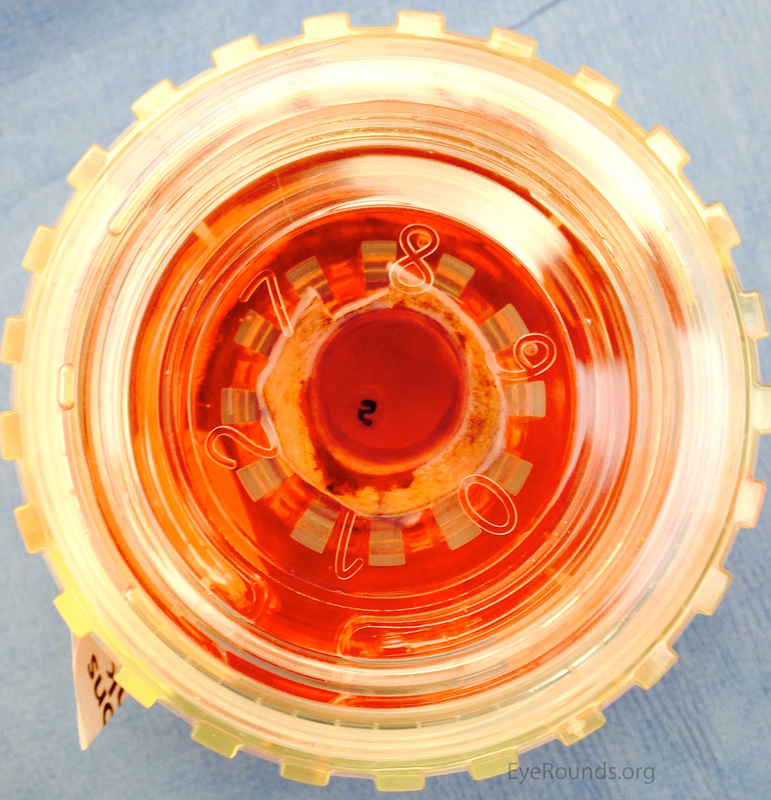 A microkeratome blade, attached to a turbine motor, is placed on the helmet of the artificial anterior chamber (Figure 6f). The motor is started and the microkeratome makes a partial-thickness circumferential incision through the stroma (Video 2). Video 2: Preparation of tissue for Descemet stripping automated endothelial keratoplasty (DSAEK). If video fails to load, use this link. The corneal flap is removed and excess fluid is removed from the remaining stroma. The flap is then placed back on top of the stroma, and stored in Optisol GS until the tissue is used in surgery. For penetrating keratoplasty, no additional preparation is needed after the tissue has been procured. The tissue is sent directly to the surgeon for transplantation (Figure 7). The surgeon can then punch the tissue to the desired size intraoperatively. Figure 7: No additional preparation is needed after procurement for a donor cornea used in penetrating keratoplasty (PK). Miller, CS, Abdullayev, EE. Science of Comprehensive Eye Banking. 1st Edition. Outskirts Press, Inc.; 2014.